I’ve had many opportunities recently to visit some of the awesome urban farms in Vancouver lately. Many of these tours have been organized as part of a tour/potluck series by Young Agrarians, and have been great chances to not only see cool farms, but meet some of the amazing people that are part of the food revolution happening here and everywhere. Definitely check them out! City Beet Farm is a funky farm set up, run by two young women in their first year of independent farming. They cultivate 8 front yard spaces in the Mount Pleasant area of Vancouver, and move around mainly by bicycle. Working mainly in a CSA (Community Supported Agriculture) model, they seem to be doing pretty well in their first year. Great example of how food can be grown on land in the city, look amazing, and feed people! The half acre cultivated by Farmers on 57th is a hotbed of productivity. Although there have been more in the past, one farmer, Tess, is running the farm this year. They sell through a 40 member CSA, and at markets through the City Farms Co-op. Our group was particularly impressed by the large tomatoes being grown, outside of a hoophouse, which we haven’t really seen being done on a farming scale in Vancouver. 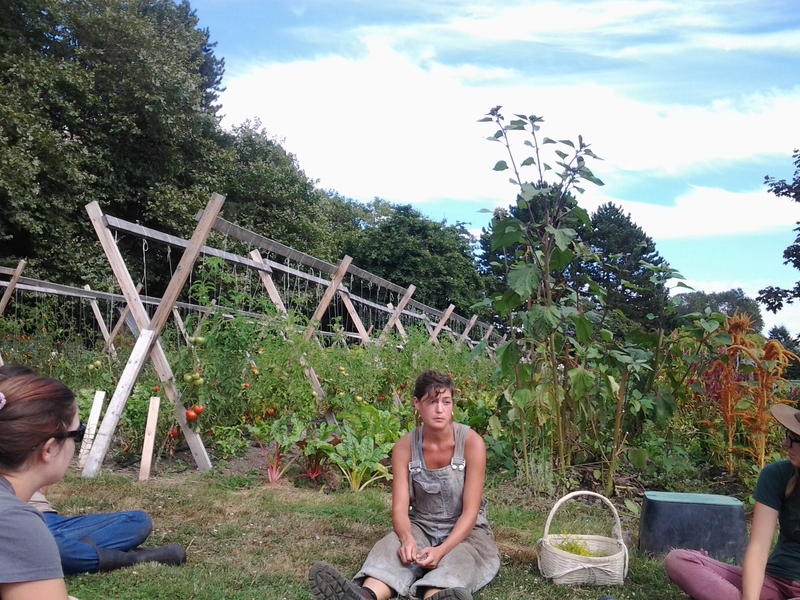 They work with minimal machinery, and really work to include community as part of their work, encouraging CSA members to come and hang out on pick up days, and working with the Coastal Health facility on whose property they farm. This was another Young Agrarians potluck, and so much fun to visit. Southlands Farm is a magical place where chickens and sheep wander around, and also includes horses, ducks, goats, and a pig. The main income from this farm is the educational programs, which connect kids with farming in an urban area. The highlight for me was trying to milk one of the goats (pretty unsuccessfully). While not following the more traditional farming structure, Southlands shows how a working farm can be integrated in a residential neighbourhood, and engage families in growing food, caring for animals, and generally stewarding the land. Fresh Roots has a pretty unique system. They farm in schoolyards, with 2 main half acre plots on 2 different school grounds. Along with being a working market garden, selling the produce to the school cafeterias as well as farmgate sales, they have a strong focus on education and community building. They use their highly visible position at the school to engage people in conversations about local, organic food, about different food traditions, and about how the farm can be a part of the community. Who wouldn’t want a cute guy like this guarding the chickens? Yummy Yards is an urban farm with a variety of locations in Vancouver and Richmond, and I had a chance to visit the home base in Richmond as well as 3 of their urban lots. 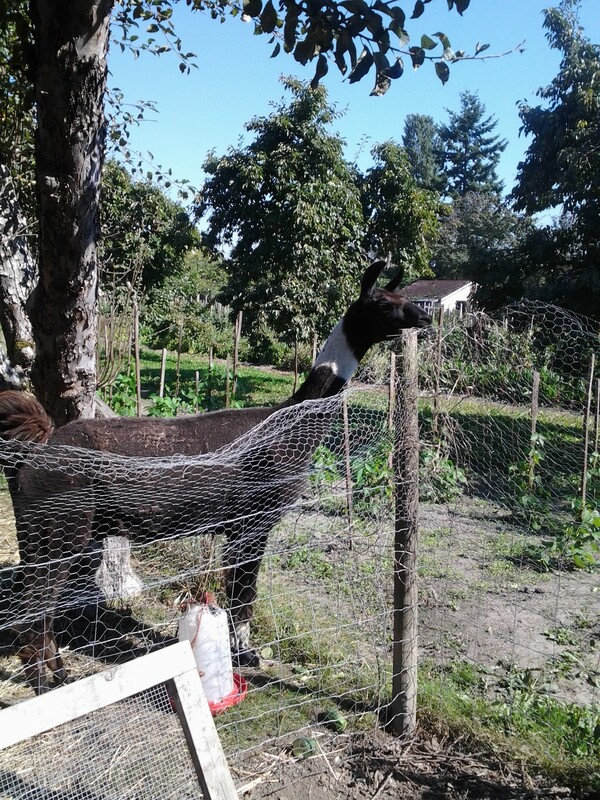 At home base, I got to meet the chickens and Reverend, the llama, who has now completely convinced me that a llama is a great addition to my farm plan! Farming in front yards has some pretty interesting implications, not least among which you need to keep your garden beds very weed-free, since you’re usually on someone’s front yard, and there are often challenges around neighbours, different expectation, watering, and the logistics of just moving from one place to the next. But Yummy Yards makes it work well, and it’s a pretty interesting operation. Urban farming is a pretty awesome thing that continues to grow in Vancouver. It is a great way to combine food production with education, and increases the connection of urban dwellers to where their food comes from. It might not be able to produce on a huge scale, but small areas can be highly productive, and I think the fringe benefits to society are much greater in terms of visibility, awareness, and overall well-being of people living nearer to thriving food gardens. 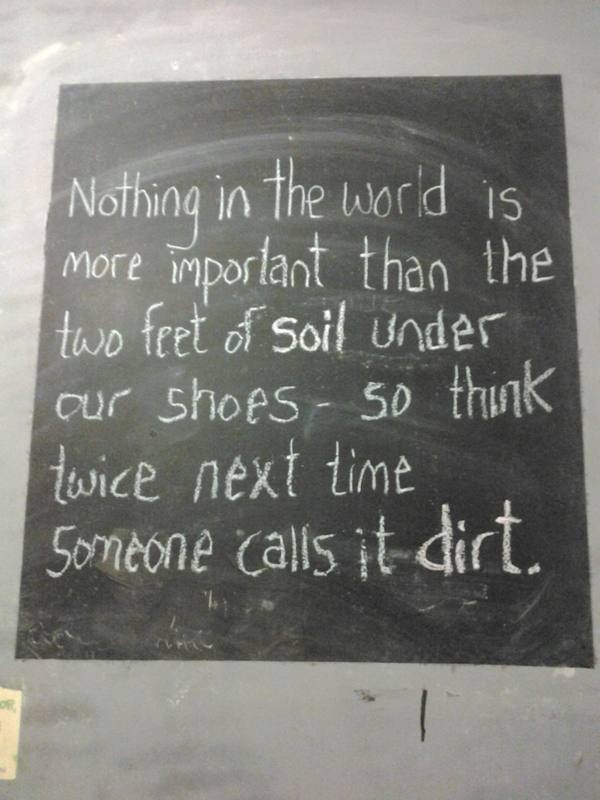 While I don’t think urban farming is for me, I have a great admiration for those who do it, and think they deserve a lot of recognition from us urban dwellers.